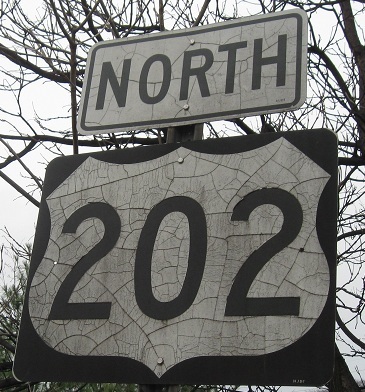 US 202 used to be US 122, and that's what it should be. The hodgepodge road has far too many multiplexes between Maine and NJ. In fact, in NJ alone 202 multiplexes with NJ 23, NJ 31, US 206, and CR 511 - and the latter section is county-maintained! It also used to (very briefly) multiplex with NJ 24, back when that road went west through Morristown toward Chester. South of US 22, US 202 splits off of US 206 and becomes a four-lane expressway and then freeway, and stays a major road through PA down into MD. That's why it should be US 122. Oh, and don't get me started on how US 206 should take the name of the state route that extends it to the south, NJ 54. This BGS may barely be on the PA side, but it's unclear. What is clear is that TRUCKS + BUSSES used to have to do something that they clearly don't any more.